These look really good! 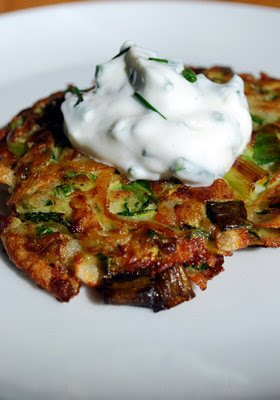 A great alternative to traditional potato pancakes with more vegetables, yum! I cannot wait to try these! They look so good and are totally within my budget and healthy eating lifestyle. 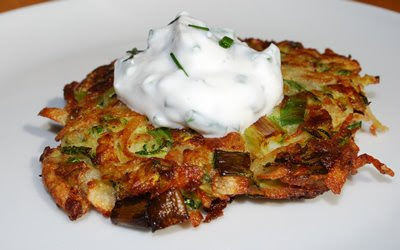 I love an easy latka alternative. Thanks!! These look not only delicious, but very eye appealing. I'll definitely try them. I've made these before and they're great! Beautiful! Would be great with poached eggs and either leg ham or smoked salmon for a super tasty breakfast. Great recipe. I love zucchinis in anything and pairing them with potato and herbs is nice. These look fantastic! I have tons of zucchini. I can't wait to try this. These look so good. I'll have to try them! I've been looking for an excuse to buy some zucchinis at the farmer's market. Now I'll have to get some! Looks Yumm! I make something similar, but instead of wheat flour I use chick pea flour and rice flour.. The rice flour makes them crunchy! Looks absolutely delish! They would be great as an appetizer at a summer party or just as a side for dinner. So light and summery. BTW, I love your recipes - or rec(ession)ipes! Great blog! Another home run! Thanks for sharing. Since I have a garden that produces TONS of Zucchini I am always looking for additional ideas. Zucchini Bread, Zucchini Pasta (just julienne) zucchini and carrots and this one are just a few of those stored in the book. I use Matzo Meal rather then flour and only 1/2 cup, and top it with Smoked Salmon and sour cream. Pre cook the potatoes and make small balls, roll them in beaten eggs and fry. I put a small cube of smoked salmon in the middle and serve with a dill/yogurt "sauce." Anybody have any other ideas of what to do with 50 + lbs of zucchini a week? I am so excited that I just found your blog! I am SO delighted with your incredible resource of gorgeous economical recipes! Hooray! ooo -- I like the use of zucchini! We're one of those wacky low-carb/high-protein people who don't eat a ton of starchy/bready things, so it's nice to see a delicious recipe that cuts down on the potato usage. Although I still love the traditional potato pancakes!!! we made them and they were delicious. almost as crucial, they looked just like the picture. surprisingly enough, we had a few left over (there were only two of us), but they were good refried as well. This is such a great way to use up all my zucchini! Looks fantastic! Mmm yummy yummy. We just had for dinner, but we're wacky so it was white squash and purple potatoes! And beet chutney that I made a little while ago. Yum. 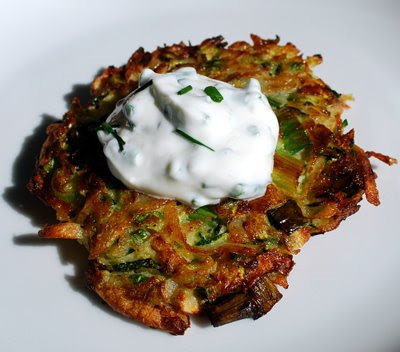 I am all about zucchini and all about latkes, so these are for me! I made these last night, with yellow zucchini, and finely diced red onion as a substitute for the scallions (since I didn't have any on hand). They were really, really tasty! I also added a half of a finely diced jalapeno pepper from my garden, but if I was to do it again, I'd add the whole thing. Love, love, love the chived sour cream topping! These look amazing. I need to make them now! Omg these are amazing. Im just enjoying them now. What a fantastic recipe. I am having tatziki sauce. So delicious :) I cant wait to make it again. These get my vote for yum! 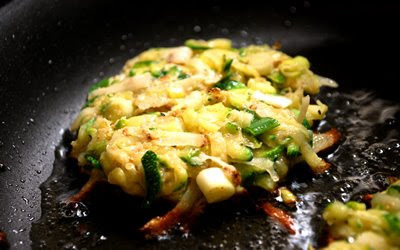 Lovely & tasty looking courgettes patties: delicious! Great recipe this time of the year. these look amazing!!!! what a perfect way to use up the plethora of zucchini we have!! These sound wonderful. 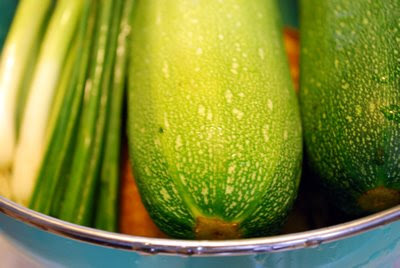 As soon as my courgettes start coming in here in the Southern Hemisphere, I'm giving these a go. YUMMY! Great post and photos. Thanks for sharing. I'd love to invite you to join me at diningwithdebbie.blogspot.com for Crock Pot Wednesday. Lovely, tasty!! Looking so goood! Looking for the perfect place to promote your blog? Attract more people to your blog, connect with other bloggers and more! The best part: It's totally FREE for all! Let's start promoting your blog!